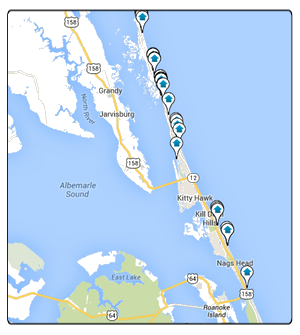 Right in the center of the Outer Banks is the community of Kill Devil Hills. Kill Devils Hills is one of the largest Outer Banks communities and usually has a good inventory of homes for sale to choose from. There is a thriving downtown filled with restaurants, shops and plenty of summer activities. The homes for sale in Kill Devil Hills start at just over $100k and top out at just over $1 million. If you see a home for sale in Kill Devil Hills you would like to tour, please give us a call. Listing courtesy of Lisa Braswell Realty.